The happy posts are up, now onto a more serious note. 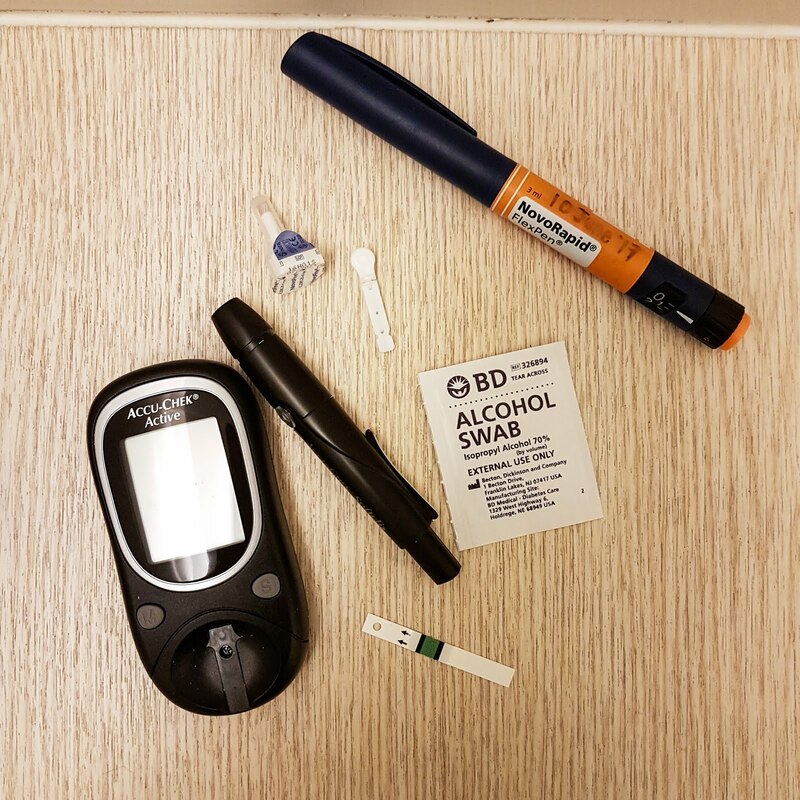 Once we confirmed the pregnancy using the Clearblue test kit, I know my pregnancy journey would not be an easy one. I have Hypertension and Type 2 Diabetes. I stopped my Hypertension medication (Atenolol) immediately but continue with my Diabetic medication (Metformin). On the day we tested positive, just nice 1 week later was my usual follow up at the Polyclinic. So, we didn’t make any Obgyn appointment but just wait until the appointment date. During that time, I was given Methyldopa to replace the Atenolol and continue taking Metformin. I was being referred to NUH as it is easier to get an earlier attention as I am considered a high-risk pregnancy. On the same day itself, I received a call from NUH to make an appointment with the Obgyn. The available date for me to choose was the following week. I didn’t make any research on the Dr at all, I only picked the date based on Ahbuii’s availability to apply leave. I was then being put on hold for quite a while and then being told that I am required to get attention at the soonest. So, I’m being placed as emergency appointment on the same week itself and Ahbuii is able to apply leave as well. The Obgyn made everything very direct and fast but attends to all questions. Which was understandable because the queue was crazy even with appointment. It was a very quick and direct session. A lot of questions on my medical issues but it was good. Just that my blood pressure is high. 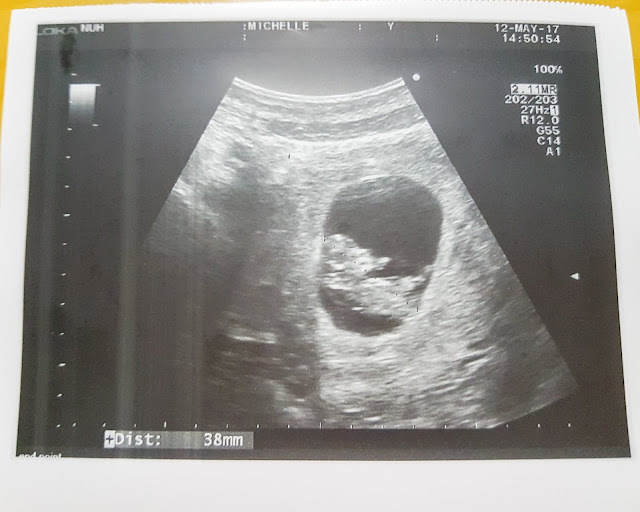 Went for a vaginal ultrasound and saw the little sac! At the end of the consultation, she advised I have to increase my Methyldopa from twice a day to thrice a day. Keep taking Metformin until I see the Endocrine at NUH. I have to take folic acid twice a day instead of once a day. And lastly, I need to take baby aspirin once a day, which I need to buy them from pharmacy. 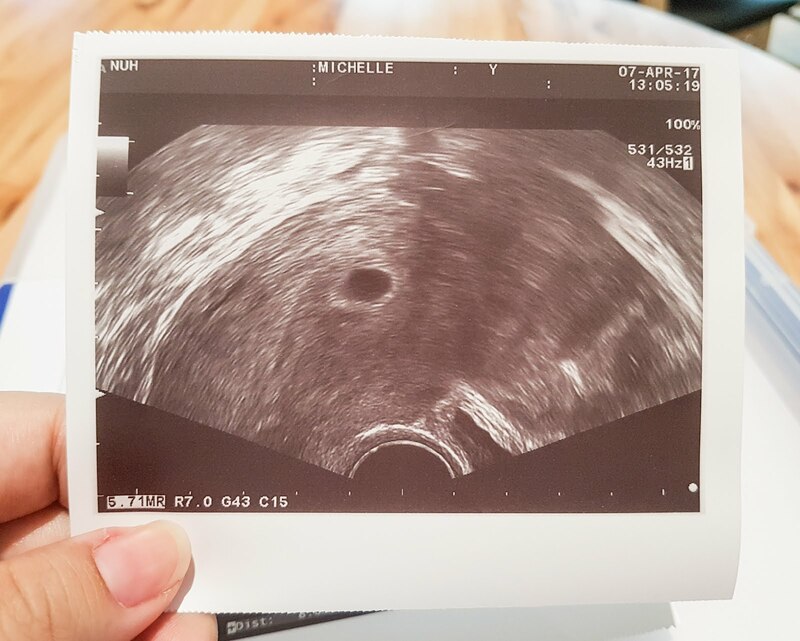 We saw the tiny heart beat! SHOOO CUTE! There’s a nurse who asked me A LOT of questions to understand more on my medical background. She also educate me clearer on the effects on a unborn baby if my sugar level is high even by 1 point. She said the Dr is very strict and I MUST test my glucose accordingly and jot them down. Once a week for 7 point reading and other days on 4 point. 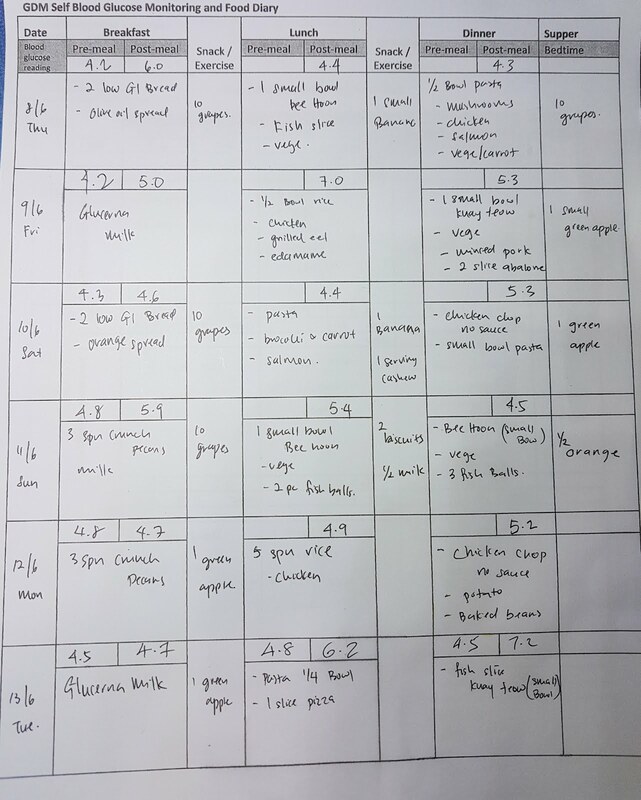 7 point includes pre breakfast, post breakfast, pre lunch, post lunch, pre dinner, post dinner and bedtime. 4 point is more simple, which is pre breakfast, post breakfast, post lunch and post dinner. One of the many records jotted down. Right after the session with the nurse, I was then being sent to meet the dietitian. Finally, we meet the Dr.
After seeing the Dr, we went to the very same nurse and she taught me how to use the insulin needle as well as how to rescue if my sugar went mad low. While I was with the nurse educator, the Dr’s nurse came and inform me that I need to do eye test, blood test and urine test. So, off I went for the eye test, blood drawn and urine sent. At about 7:45pm, I received a call from the Dr herself. She mentioned the test results came good but I’m lacking of Vitamin B12 and Vitamin D. My folate was high, so now I have to cut down my folic acid from twice a day to once a day. Wake up - Baby aspirin 100mg, Folic Acid 5mg, Methyldopa 250mg, Obimin. We saw the tiny hands and feet waving around. 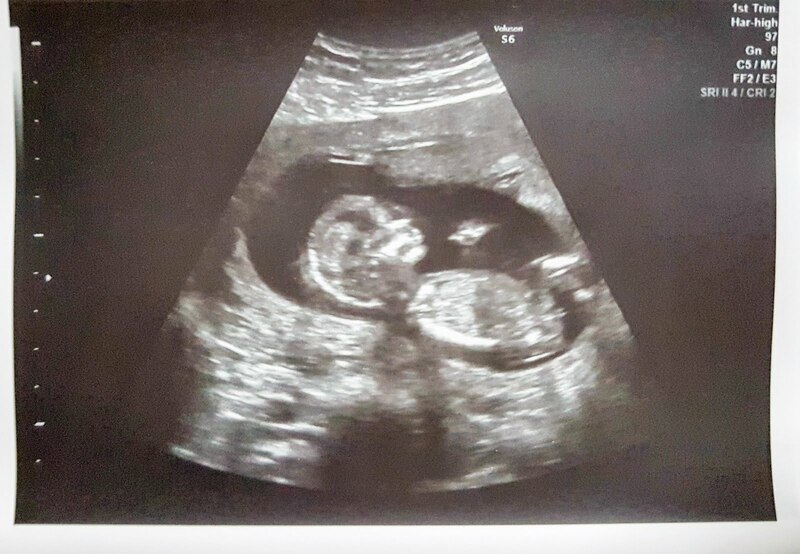 After scanning, Dr asked me some questions and we made an appointment for the OSCAR scan. While it was an optional scan, I am high risk pregnancy. So, we decided to go ahead and go for the scan. The scan will be in 2 weeks time at NUH. Today was the best birthday present Ahbuii received. Went in the scanning room twice and the baby still did not turn to a position that they need to scan the nasal bone. 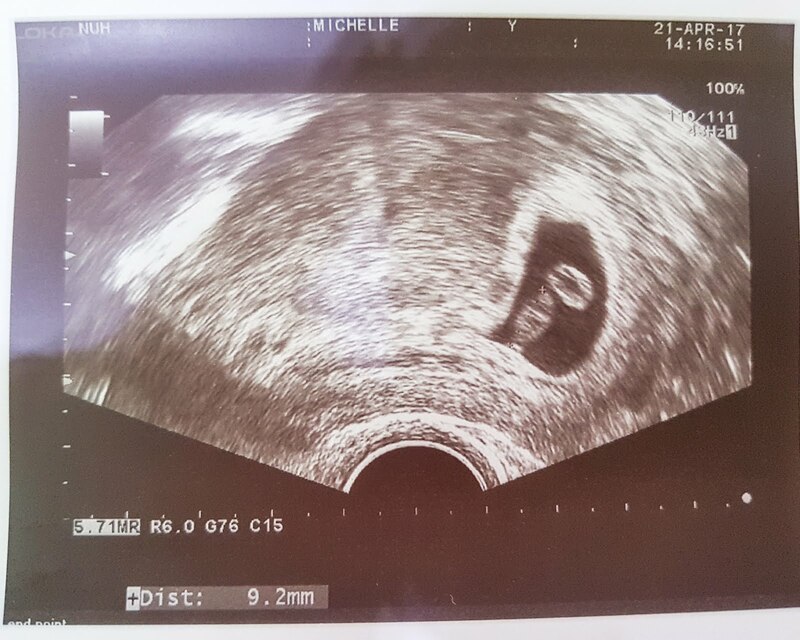 There’s one part the baby raised 1 hand… seems like telling us, “STOP! I’M NOT TURNING OK? !” Only until the third time going in the baby turned. After the OSCAR Scan about a week later, the result was being advised by the Obgyn. The Obgyn advised that I need to go for another thorough scan to make sure the baby is OK. Whenever the Doctors or nurses put needles in me, be it for drawing blood or putting stuffs in me, I never dare to look at the needle going in. I always look away and hold the pain. Sometimes, I wont even know it is done. Sometimes the pain is bearable. From a person who didn’t dare to look at the needles going in me, I am putting needles in me all by myself now. 4 times a day. Although, it is a very fine needle compare to the needles for blood drawing, it is still a needle. Sometimes, there is pain. Sometimes, there is none.